Why consider sailing with us on Ocean Gem? If you want to become a capable and confident offshore sailor, the best thing you can do is go to sea with experienced skippers on well prepared yachts. It does not matter how much you have read or how much inshore sailing you have done, going offshore on an ocean going yacht is whole new experience and a key step to preparing the offshore sailor. As your skipper, I have completed more than 25,000 nautical miles of coastal and offshore passages, competed in more than 400 yacht races and skippered multiple blue water ocean crossings during the past decade. Imagine combining your best school camp experience, with a capable well organised sailing team and the natural ability for creating team morale, regular humour and a highly personalised experience. Having led teams from 7 to 700 in size on the water, in community organisations and in business, I have the ability to take a bunch of strangers and form a cohesive, friendly, functioning team, in no time at all. To have an exceptional experience on ocean, you need to be part of a great team. I have found that the more sea miles I have under my belt from all sorts of conditions, the more my focus on ‘safety first’ has developed. On Ocean Gem we have never spared any expense when it comes to safety equipment, use of technology and boat preparation. You can be confident our safety standards will give you peace of mind when heading offshore on Ocean Gem. There are countless examples of delivery skippers in the news and on social media who went to sea on a tight schedule, on ill prepared vessels they were unfamiliar with, that they sailed short-handed with one or two “free” delivery crew, then ended up in trouble. These boats often have stressful, poorly prepared voyages, with equipment failure and crews arriving exhausted, swearing never to step aboard a yacht ever again. Choose your skipper and vessel wisely, your life depends upon it. Ocean Gem has an experienced team in excess of 20 sailors to draw upon. 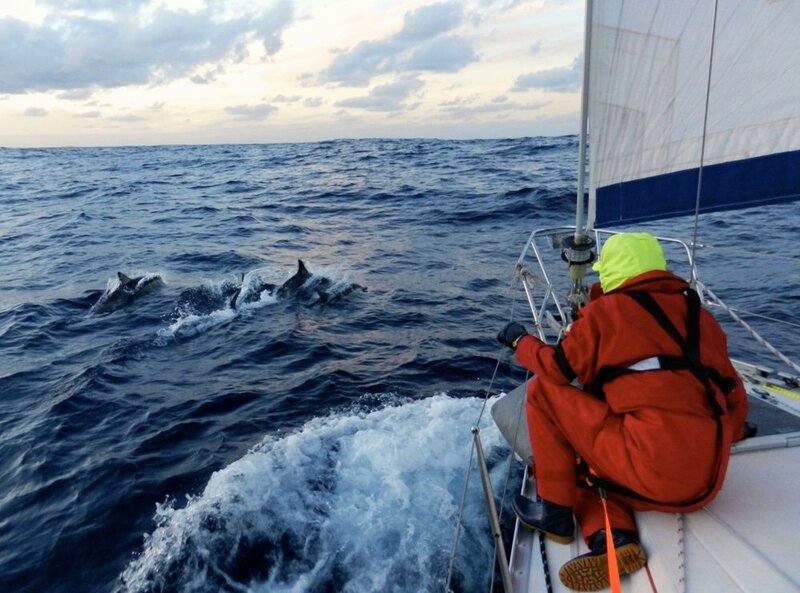 This group includes experienced sailors, helmsmen, skippers, industry craftsmen and professionals; all of who regularly race onboard Ocean Gem and also complete ocean passages. At any time we have a team of 4-10 onboard depending on the style of race, regatta or passage we are doing. In the past 12 months our team have collectively sailed Ocean Gem more than 10,000nm, including to north to Hamilton Island, east to Lord Howe Island and south to Sydney and to Hobart within Australia and across the Tasman Sea to New Zealand and back. You will learn more onboard Ocean Gem in just a few days, than you will learn from reading a bunch of sailing books. Our hands-on, fast-track learning environment, immerses your straight into offshore sailing. You’ll become confident within hours of getting started and relish the opportunity to learn from the extensive knowledge of those around you. From navigation to sail management and trimming, plumbing, mechanical and electrical systems, watch planning, heavy weather preparation, making landfall and weather analysis; we’ll teach it all in plain, everyday english. Every race, regatta and ocean passage is different and we always have to adapt to the challenges, conditions and weather we face. You'll become part of the team and decision making process, the moment you step aboard. The more offshore sailing I do, the more I plan for every scenario. As a 24 year old, I did my Private Pilots License and also completed my Commercial Pilots theory subjects. I chose not to make a career out of flying, but it taught me something I have carried through all of my ocean sailing miles and thats to always have Plan B in the back of my mind. What if we can't get into that anchorage? What if the engine stops? What if we can't fix that pump? What if he don't get there before dark? What if we lose a halyard?... The list can be endless, but my propensity for taking tools and spares that match the risk and expected conditions, has meant we have always had the ability to respond to difficult situations and set backs with a Plan B, that has ensured our safety, sea worthiness and ability to continue our race or our passage safely. Over the years Ocean Gem has become stronger (and heavier) as we have upgraded and updated gear, to ensure we are always 'match fit' and ready to face the most extreme conditions. Confidence in the seaworthiness of your yacht and capability of your team is what gives you confidence and peace of mind at sea. Its almost never about luck. A successful ocean racer once sailed to me "the good sailors get the good luck". I respect the ocean, the weather and the power of mother nature. Safety and prevention is always our highest priority. As I learned with flying, many a private pilot has died from "get there-itis" by pushing on ahead into deteriorating weather, because of a rigid deadline. A wise man once said: "There are old pilots and there are bold pilots, but there are no old, bold pilots." While sailing is a lot more forgiving than aviation, any fool can go to sea. We take a maximum of 2-4 paying crew on each ocean passage (plus 1-4 experienced Ocean Gem crew members, to a maximum ocean passage crew of 6. We've got bunks for 7 and plenty of room for this number. With a small passage crew, we can more easily meet each person's specific needs, whether it be more time at the helm, learning navigation or practicing sail trimming. On ocean races and regattas, we’ll have a larger crew of 8-10 to meet the demands of competitive round-the-clock racing. We’ll hot-bunk on ocean races (50% in bunks / 50% on watch) and work together on a two-team watch system, to maintain boat speed around the clock.